The My Plates proposed Route 66 license plate design may not proceed. 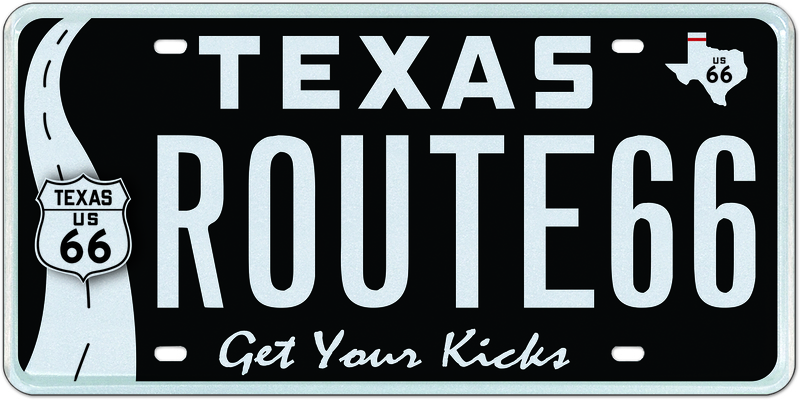 The proposed Route 66 specialty plate design in Texas may have hit too many speed bumps along the way as it is currently well short of the required 200 pre-orders for this plate to hit the roads. The proposed design by My Plates.com was submitted to the TxDMV board last February and was approved pending the vendor achieving 200 pre-orders within a 180-day period. The deadline to meet the 200 pre-orders is August 8, only a month away and My Plates has stated that they are sitting at only 100 pre-orders. “At this stage, without a push from interested Texans, it looks unlikely that this plate will proceed,” said Steve Farrar, President for My Plates.com. Several other states including Illinois, Oklahoma, New Mexico and Arizona have already launched dedicated Route 66 plate designs in their respective markets. The company has been working with a few Route 66 organization groups in Texas and has provided an attractive discount for any pre-orders on this design, up to $99 off. “Unfortunately, it appears that this plate may not carry enough curb appeal,” said Farrar. Another plate struggling to get the show on the road is the Racing Stripes Red design, currently sitting at around 90 pre-orders. Texans wishing to get more information about these two pre-order designs may go to http://www.myplates.com/route66 or http://www.myplates.com/ComingSoon. My Plates designs and markets new specialty license plates as a vendor for the Texas Department of Motor Vehicles. Texans have bought more than 370,000 My Plates since November 2009, putting more than $63M in the state general revenue fund. My Plates’ goal is to create a long-term, mutually beneficial relationship designed to maximize revenues for the state through the sale of My Plates specialty plates. http://www.myplates.com.